Simms Rod Cam Straps allow you to secure rod tubes and other loose ends like a pro, with Dry Creek® packs- and virtually any bag or pack with webbing or strap docks. Why leave your quiver at home when you can add Simms Rod Cam Straps to your pack or duffel and make sure you always have the right rod for the job. These rubber straps make securing rod tubes or other gear to your favorite travel bag or pack easy. They attach to all Simms Dry Creek® packs and bags as well as other brands of course. APPROX. WEIGHT: Weight: 0.8 oz. 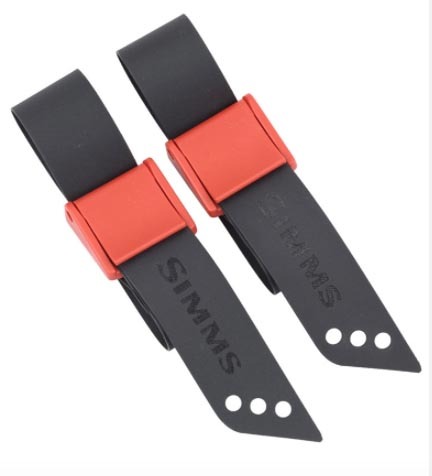 DIMENSIONS: Dimensions: 13" x 1"
Simms Rod Cam Straps- item #12304001 and come in a pack of two.